Leadership Fayette County, sponsored by the City of Fayette, Fayette Chamber of Commerce, and Fayette Campus of Bevill State Community College, provides existing and emerging leaders with opportunities to enhance their civic knowledge of Fayette, hone their leadership skills, and network with leaders across the community. Past programs have helped participants better understand how our community works, build relationships with the region’s current and future leaders, and has inspired leaders to utilize their talents to serve the community. During Leadership Fayette, participants will learn about how different businesses and services relate to each other, as well as the interrelationships between a variety of local issues. 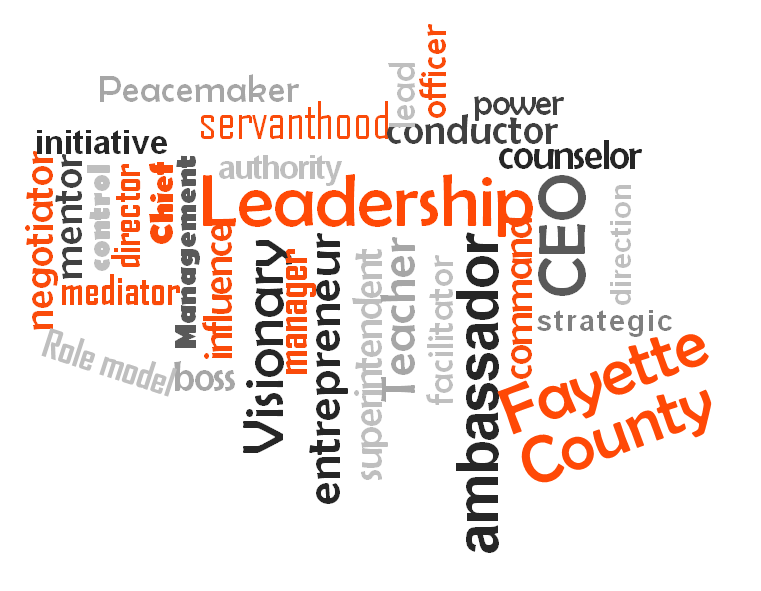 What Can Leadership Fayette Do For You? **Applications for the Leadership Fayette County Class of 2017 are now being accepted. What Is the Time Commitment and Class Format? Nine sessions will be held between September 2016 and May 2017, from 8:15 a.m. – 2:15 p.m. Local, regional, and state leaders will share their knowledge and perspectives through presentations, interactive sessions, panel discussions, and community improvement activities. Class formats will demonstrate real situations, challenges and opportunities in Fayette City/County, and participants will gain first-hand experience through behind-the-scenes tours of various public and private facilities. Attendance requirements reflect the commitment necessary to receive a meaningful experience from investment in the Leadership Fayette program. Participants and their employers must be willing to commit the necessary time to fully participate in the program. To graduate, a participant may not miss more than two class sessions and must complete additional enrichment activities to make up any missed time. The class project serves as a central component of the Leadership Fayette experience. The project provides participants with an opportunity to turn concepts into workable projects and problem solving by working in small teams to accomplish a larger mission. The project directly correlates with themes outlined in the Fayette Strategic Plan and is a capstone to the Leadership Fayette class experience. Beyond the monthly class sessions, periodic optional opportunities will be provided for additional enrichment of leadership and community knowledge. Examples include a day tour to Montgomery to understand the State Legislative process and a day tour of local businesses. Class representation of diverse backgrounds and experiences. Tuition for Leadership Fayette is $200 and includes all expenses for the (9) nine monthly sessions, breakfast, snacks, lunches, limited transportation, and graduation. Costs of any optional enrichment opportunities, if any, are not included. Tuition must be paid in full or payment arrangements made by September 29, 2016, the first day of class. There are a limited number of scholarships available if financial assistance is needed – Contact the Mayor’s office. In addition, we will be inviting a limited number of Fayette County school students to participate in the program. If you or your company would be willing to donate $50 – $100, or more, to sponsor a student, please let us know. This money will help defray the costs of supplies, meals, and transportation. Payment is due by the first class date. Email a signed, scanned copy to brucebeede@gmail.com. Questions or requests for further information about Leadership Fayette should be directed to Bruce Beede – brucebeede@gmail.com or 205-748-0023 or 214-769-2803 (cell). The Leadership Fayette program is a “backstage pass” to learn about the various community assets that contribute to the prestigious quality of life that the City and County of Fayette enjoy. The program is designed to contribute to the professional development of current and future leaders of organizations in and around Fayette, and to demonstrate the value that comes from serving as a community leader. The curriculum for each of the classes over the nine months includes three blocks of training. Block 1 is an education block designed to build understanding of the community and its structure. Block 2 is a personal leadership skills development block. Block 3 is a working session during which participants will work in teams on community improvement projects. In addition to the ongoing monthly development classes, a variety of “optional” opportunities will be provided to enrich the learning experience of participants. This may include tours of local industry, attendance at specific local elected board meetings, participation in panel discussions for student leader programs, youth mentoring opportunities, engagement in economic development activities, and various arranged volunteer opportunities. This session provides a perspective of Fayette County and its cities’ history along with a “State of the City/County” overview from elected or appointed officials. Participants also gain insights into government and services that contribute to the quality of life in the community. Presentations by local health care providers to gain a look into patient care and issues affecting health care institutions and treatment. Participants also gain awareness of community agencies that meet the health care needs of the indigent and uninsured; and those facing physical/mental challenges. Visits by representatives from Fayette County School District, Bevill State Community College, and other education entities to explore topics such as curriculum, school finance, technology, community partnerships, future directions, and current educational issues. The session provides participants an awareness of culture and arts in the community as well as the variety of leisure activities available in the area. Discussion about the variety of activities available in the area as well as special challenges and advantages they face. This program is designed to increase participants’ understanding of personal and business financial literacy – the ability to understand how money works in the world; from saving it to spending it, investment, understanding invoices, budgeting, and charitable giving. This session covers topics of concern for the population of Fayette County to assure that services to enhance life are provided to all segments of the population. This session introduces the US Department of Commerce’s framework for organizational performance excellence, called the Baldrige Framework. This framework includes Leadership, Strategic Planning, Customer Engagement, Data and Information Management, Human Resource Engagement, and Process Management and Control. This session introduces the concept of servant leadership as a leadership style and method of doing business. Community Improvement Project planning sessions – The session concludes by looking at “The Year in Review” and challenges participants to reflect on their leadership journey and envision their future involvement. The session provides a guide for effective non-profit and civic board membership and includes a nonprofit agency fair.